As widely reported, dozens of Iranian students were arrested Monday after they protested a government decision to rebury troops who died in the Iran-Iraq war on the grounds of a Tehran university. 32 years ago, this very month, another form of Iranian student protest was captured in the mainstream media. 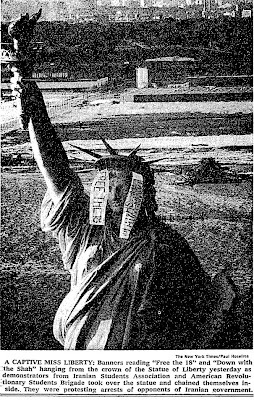 The caption says it all: A CAPTIVE MISS LIBERTY: Banners reading “Free the 18” and “Down with the Shah” hanging from the crown of the Statute of Liberty yesterday [Feb. 15, 1977] as demonstrators from Iranian Student Association and American Revolutionary Students Brigade took over the statute and chained themselves inside. They were protesting arrests of opponents of Iranian government. Are we missing a lesson? You are currently browsing the archives for the Student Protests category.